Abdominal bloating is usually associated with over-eating, food intolerances, constipation, intestinal gas, PMS (or PMT) and menstruation when the abdomen feels uncomfortable, full and tight. When digestion is poor, waste materials and gases can remain in the gut for long periods of time – often at high temperatures and pressures – and stretch the gut walls beyond their comfortable limits. Bifidobacterium bifidum Rosell-71: naturally resident in the colonic (large intestine) microflora, B. bifidum supports the production of antibodies, promotes detoxification and maintains resistance to undesirable pathogenic and putrefactive bacteria. In the colon, B. bifidum flourishes well with fructooligosaccharides (prebiotics) where it supports the intestines to assist transit, promote comfort and optimise a healthy frequency and regularity of bowel movements. Prebiotics: The non-digestible FOS (fructooligosaccharides) safely make their way to the large intestine (colon) where they act as a food source to stimulate abundant growth of bifidobacteria. The symbiotic relationship between bifidobacteria and prebiotics in the colon has a great impact on supporting intestinal health and wellbeing. Lactobacillus casei Rosell-215: an extensively studied species naturally resident to the intestinal flora; this strain has been researched in its ability to resist gastric acidity and bile salts in the harsh stomach environment in order to reach the small and large intestines alive where it exerts its probiotic benefits. L. casei has been shown to modulate the composition and growth of bifidobacteria in the colon and to support regularity. Lactobacillus acidophilus Rosell-52: a natural resident of the intestinal microflora; this strain has been well studied to survive the gastric acids and bile salts expected at mealtimes and to reach the intestines without damage. In addition, L. acidophilus can adhere to the cell wall lining of the intestines where it exerts it beneficial effects in terms of inhibiting intestinal pathogens and supporting immune cells. Lactococcus lactis Rosell-1058: This strain is obtained from the kefir culture and is renowned for antimicrobial benefits in supporting the body against undesirable harmful bacteria and some fungi. 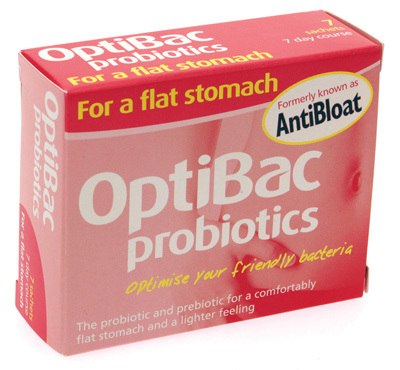 OptiBac Probiotics guarantees 5 billion live micro-organisms per sachet until the best before date. As a food supplement For a flat stomach can be given to adults with the following recommendations: Take one sachet daily with breakfast for a 7 day course once a month or as professionally directed. Pour an inch of cold water into a tall glass, shake sachet and gently sprinkle in the powder. If necessary, mix with a teaspoon to disperse any remaining powder. It is not recommended to give probiotics to severely immunosuppressed patients, infants with short bowel syndrome (SBS), post cardiac surgery patients, patients with pancreatitis, patients in the Intensive Care Unit (ICU) or patients with blood in the stool unless under a doctors care.